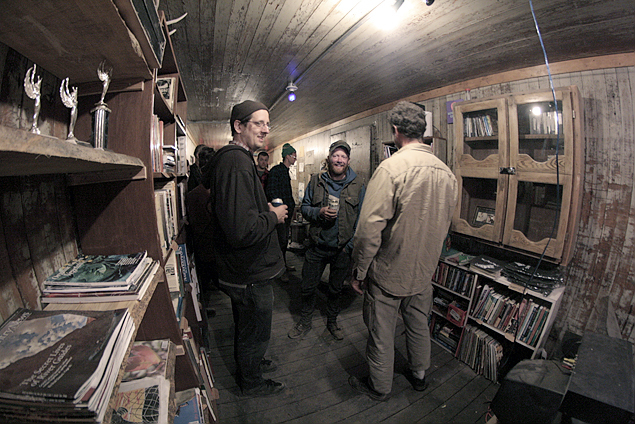 In June, 2010 the BBCRC opened up our long-planned Library/Resource Center and Art Show Space in our Pacific Fruit Express "Reefer" car. This resource center is part rail archive, part info shop/zine library and part "hang-out spot" for reading, watching movies, and listening to music. The reefer holds an extensive and growing collection of books, zines, magazines, records, CDs and films. We hosted our first art show in the "reefer" back in February, 2010 on behalf of the Weed Arts Council and had our first BBCRC member art show in June. The BBCRC continues to host an online BIBLIOGRAPHY of nomadic rail culture resources, the most comprehensive listing of such resources that has ever been compiled (see below). The library is focused on various aspects of railroad culture and local railroad history. Our long-term goal is to have the most comprehensive collection of materials on nomadic rail culture anywhere. This collection will be founded on the bibliography that the BBCRC has compiled and updated, based on the original hobo/railworker bibliography assembled by "Shoefly Jay" in 1999. In addition to rail-related topics, the library includes a growing section on local ecology including maps, field guides and other info on our unique natural environment in Siskiyou County and the wider region. We also have a growing collection of self-published "zines" on a whole variety of topics as well as various other DIY-oriented resources. We are also putting together of collection of rail-oriented and other interesting DVDs and hope to be able to have regular "movie nights" in the reefer in the near future. We are accepting donations for the library. Donations can be mailed to the Center at 800 Black Butte Road, Weed, CA 96094. If you have large collections, especially of magazines, please check with us before sending us your materials. 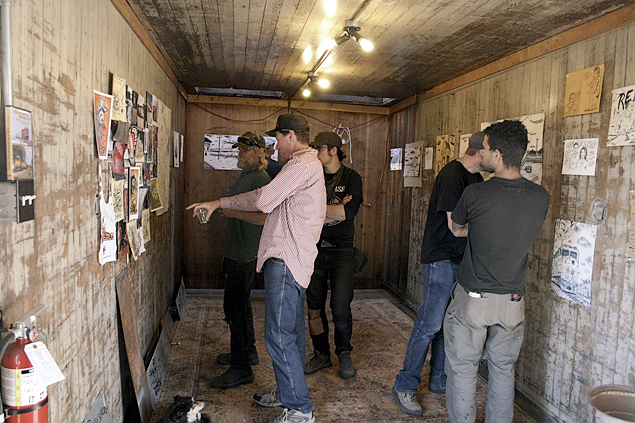 The worn wood walls and natural lighting from the "ice hatch" skylights in our reefer car make for a unique art gallery space. In mid-2010 we began hosting art shows in the reefer and now intend to have 2-3 shows per year as well as displays from a permanent collection of BBCRC art. Art shows are likely to revolve (but not exclusively) around themes of railroading and the history and natural environment of our region. Please let us know if you are interested in participating in an art show at some time in the future.